WASHINGTON - Two weeks after a dark-of-night barrage of mostly U.S. missiles and bombs opened the international air assault on Libya's Muammar Qaddafi, the American combat role is ending, the rag-tag rebels are reeling and the Pentagon is betting its European allies can finish the job. Qaddafi is still standing, with a few uncertain signs that his inner circle could crack. The Obama administration is hoping that if Qaddafi's government doesn't implode soon, a relentless campaign of airstrikes on his tanks, air defenses and most trusted army units will at least weaken his ability to survive a renewed uprising by a disjointed opposition. 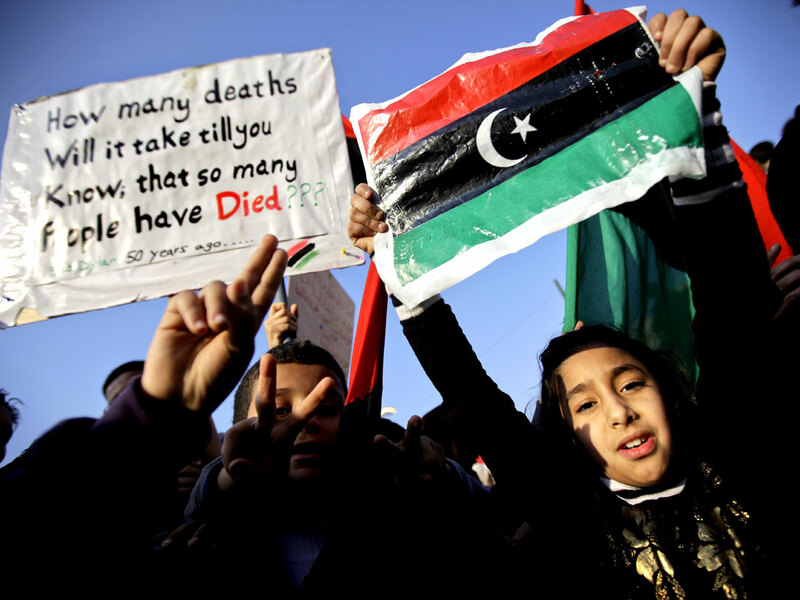 The rebels initially rattled Qaddafi but in recent days have given up most of their gains. The bottom line, according to Adm. Mike Mullen, chairman of the Joint Chiefs of Staff: "He's still killing his people." So the mission remains incomplete, but the U.S. is following through on a pledge to shift the main combat burden to Britain, France and other NATO allies. Starting Sunday, no U.S. combat aircraft are to fly strike missions in Libya. NATO's on-scene commander can request American strikes in the days ahead, in which case they may have to be approved in Washington. On Saturday, U.S. combat aircraft flew 24 strike missions in Libya, the Pentagon said. Some in Congress, including Sen. John McCain, the ranking Republican on the Senate Armed Services Committee, have criticized the decision to withdraw U.S. combat aircraft from the regular cycle of NATO strikes. Also withdrawing from the combat mission on Sunday will be the initial workhorses of the military campaign: U.S. Navy destroyers and submarines that launched Tomahawk cruise missiles from their positions in the Mediterranean Sea. No Tomahawks were fired Saturday, the Pentagon said. The U.S. planes and naval vessels will be on standby in case NATO commanders decide their forces cannot handle the mission on their own. Combat air missions will continue to be flown by Britain, France and other NATO member countries. A larger group of participating air forces will patrol over Libya to ensure that Qaddafi's air force stays grounded. U.S. planes will support them with refueling aircraft and electronic jammers. The U.S. Navy began the operation March 19 with 12 ships in the Mediterranean. As of Friday, nine remained: the submarines USS Florida and USS Scranton; destroyers USS Stout and USS Barry; amphibious warships USS Kearsarge and USS Ponce; the command ship USS Mount Whitney; and two supply ships, USNS Robert E. Peary and USNS Kanawha. The subs and the destroyers are armed with Tomahawks. Marine Harrier attack planes launch from aboard the Kearsarge, and the Mount Whitney had served as a floating command post for the American admiral who was the on-scene commander until NATO took control Thursday. The Mount Whitney remains assigned to the mission but the new operational commander, Canadian Lt. Gen. Charles Bouchard, is working ashore at his NATO headquarters in Naples, Italy. The U.S. Navy is likely to peel more ships away from the mission in coming days, including some of those with Tomahawks. The international military mission has been limited from the start, with the stated objective of protecting Libyan civilians from attack. But until this weekend's U.S. stand down, Air Force and Marine attack planes have chased down Libyan tanks and other targets on a daily basis. Marine Lt. Col. Shawn R. Hermley, a Harrier pilot who estimates he has flown about a dozen combat missions over Libya, said in an interview Friday that he's not personally bothered that he'll no longer be dropping 500-pound (225-kilogram) guided bombs on Qaddafi's tanks, armored personnel carriers and self-propelled artillery. He said his Harrier detachment has made a difference, while taking care not to risk civilian casualties. "If we were to walk away today, I'd be very proud of that and realize that we've made a significant impact to protect the people of Libya," he said by telephone from aboard the Kearsarge. Still to be decided is whether the White House will up the ante and provide arms to the rebels. That step, say some congressional supporters of the Libya mission, is crucial to ensuring that the strategic goal of ousting Qaddafi is achieved before he kills still more opponents. "We are concerned that regional support will waver if Western forces are perceived as presiding over a military deadlock," Sens. John McCain, an Arizona Republican, and Joe Lieberman, a Connecticut independent, wrote Friday in the Wall Street Journal. "We cannot allow Qaddafi to consolidate his grip over part of the country and settle in for the long haul." They called for a "more robust and coherent package of aid" to the rebels, who are armed mainly with light weapons. Mullen estimated in congressional testimony on Thursday that as few as 1,000 among the rebels are former members of Qaddafi's military. The rest are simply "guys with guns," said James Dubik, a retired Army three-star general who says they need American or NATO advisers and trainers to be effective. "They need help," Dubik wrote in an assessment for the Institute for the Study of War, a think tank. On the political front, the U.S. and its allies are hoping that the defection to Britain on Wednesday by Libyan Foreign Minister Moussa Koussa is a sign of things to come. "We believe that Moussa Koussa's departure is yet another sign of fracturing within the regime, and we would urge others within the regime to follow his example," State Department spokesman Mark Toner said Friday. "We've been very explicit in saying that we believe they should read the writing on the wall that they should step down." In a further indication that Qaddafi's resilience may be eroding, his government is trying to hold talks with the U.S., Britain and France in hopes of ending the air campaign, said Abdul-Ati al-Obeidi, a former Libyan prime minister who has served as a Qaddafi envoy during the crisis.